Fred Brooke of Old Lyme is the founder of AngelRide and one of the three finalists for the Oticon ‘Focus on People’ award. Frederick Brooke of Old Lyme is a finalist for a national award. The Oticon Focus on People Award celebrates the accomplishments and contributions of individuals with hearing loss, and Brooke is one of the top three individuals across the country in the Adults category. His final placement in the Awards now depends on online votes, which are open through Aug. 24. Brooke doesn’t let his hearing loss slow him down. In 2001, inspired by 12-year-old Angel Uihlein, he swam across Long Island Sound, raising enough money for Angel’s mom to stay at home with her seriously-ill daughter. AngelSwim continued over the following years, as Brooke swam 850 miles along the coast of Rhode Island, Massachusetts, New Hampshire, and Maine to reach the Canadian border, all to benefit sick children. 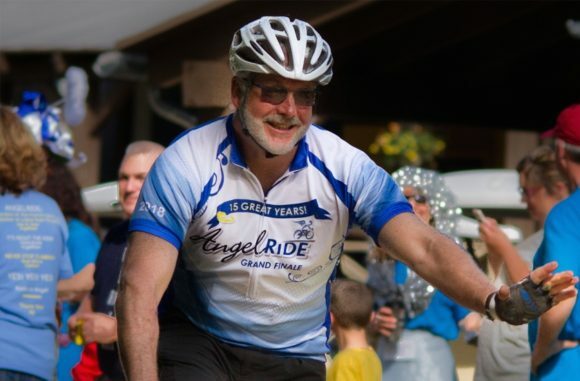 In 2004, Brooke and his partner Lynn McCarthy started AngelRide, a trans-Connecticut (135 miles, two-day) charity bicycling event with nearly 100 percent of the money raised donated to The Hole in the Wall Camp, founded by actor Paul Newman for children too sick to go to conventional camps. The money raised enabled the camp to start a Hospital Outreach program that sends specially-trained employees to enrich the lives of children in oncology wards. Today, AngelRide is an annual Memorial Day event that has raised more than $5.75 million to benefit hospitalized children. This year marks the 20th anniversary of the Oticon Focus on People Awards, the first national awards program recognizing individuals who challenge outdated stereotypes and demonstrate that hearing loss does not limit a person’s ability to make a difference. Through the awards program, Oticon continues its mission to raise awareness and open doors of opportunity for people with all degrees of hearing loss. The other two finalists in the Adult category for this year’s Focus on People Awards are Garth Baker of Twin Falls, Idaho and Clare Wolf of Rubicon, Wis.
Voting is open through Aug. 24, and the results will be announced in October. All finalists receive a cash prize. First place winners also receive a donation to a charity of their choice. To vote and to learn more about the awards, visit www.Oticon.com/FOP.